Safety in numbers? Sketching with the group. 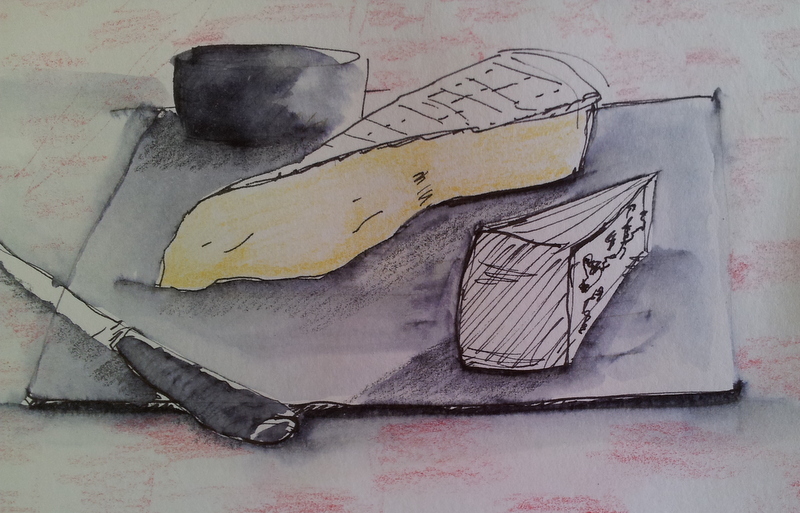 There’s been a lot happening on the urban sketching scene since I last wrote. Inspired by the Oxford workshop, we have set up a small group who have met 4 times now to ‘SketchCoventry’. We are lucky to have an excellent art gallery, The Herbert, where we meet up, and it looks as if there may well be an Urban Sketchers workshop here in Coventry next April! This is timed to coincide with the exhibition Recording Britain that is touring the country and which I caught up with last year in Sheffield. It feels good to be involved in such a fascinating project, and amazing to think that it has all come about thanks to three of us pushing at some doors and finding that they opened! We are a small group so far, but that feels fine to me. We meet up for coffee, decide where we are drawing and sometimes split into smaller groups; then we join up for lunch to look at the sketches. In the afternoon there is another foray, followed by more refreshments and more learning from each other’s drawings. It is very flexible and friendly, with ex-Oxford workshop sketchers making the effort to come from London, Shrewsbury and Banbury. 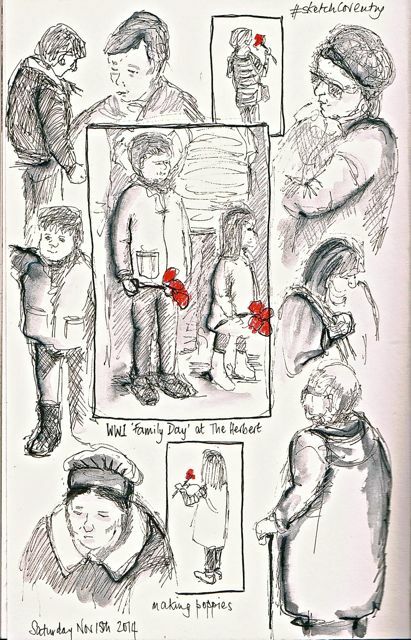 The Herbert Gallery was having a WW1 ‘family day (!) so there were lots of children clutching huge tissue paper poppies that they had made. Sketching out in public is still a challenge, but is transformed by the group effect. I don’t feel nearly so conspicuous or vulnerable when there are two or three people drawing nearby. We give each other a sense of security and confidence; it seems that as a group we are far less likely to be interrupted or criticised than on our own. I wonder whether this is objectively the case or is something that, like a placebo, just makes us feel good. 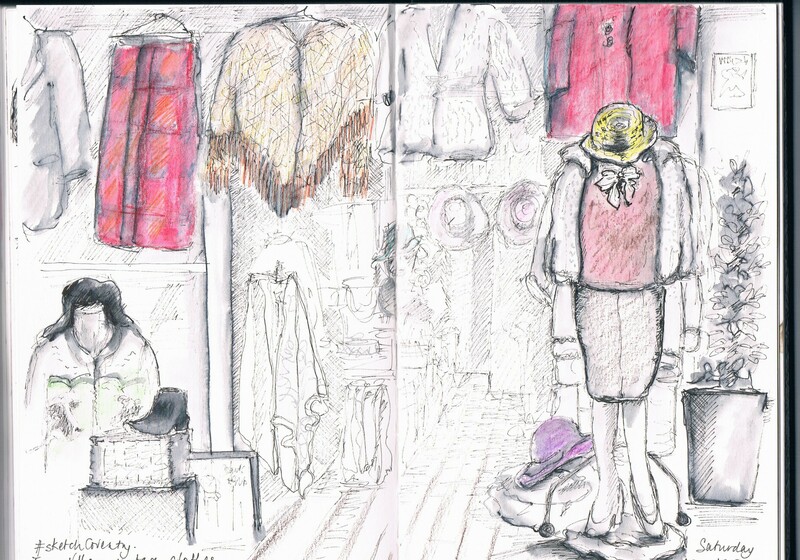 We huddled together on the sofas in ‘Fargo Village’ to draw one of the vintage clothes stall. As far as SketchCoventry goes, there is a lot of promise and very little threat. Having said that I recognise how anxious any newcomers are about the quality of their own sketches – just like I was in Oxford last summer. The possibility of humiliation feels real, even though it is far more likely to be some internal critical voice of our own than anyone in the group. This I am sure connects with our previous, probably early, experiences in groups. It’s hard to find anyone who does not have a tale of being humiliated at school, for example…. and as for the family, that’s a whole other story brewing up for the next post! This entry was posted in Uncategorized and tagged Coventry, drawing, Fargo Village, group therapy, humiliation, internal critic, Recording Britain, safety in numbers, sketch, support, The Herbert, Therapy Today, threat and promise, urban sketching on December 1, 2014 by Chris. Words. Dense little packages that unwrap themselves, setting off spirals of reflections and sensations. Literary taste bombs bursting in the mind. This last week they have been coming at me, not just from my work, but from the art world as well. It is Warwickshire Open studios fortnight, when I meander around various artist’s houses and studios, exploring what I like and what I don’t, and generally admiring the outpouring of creativity. Last year I was very impressed by Jo Roberts, and went back to see what she’s been working on. 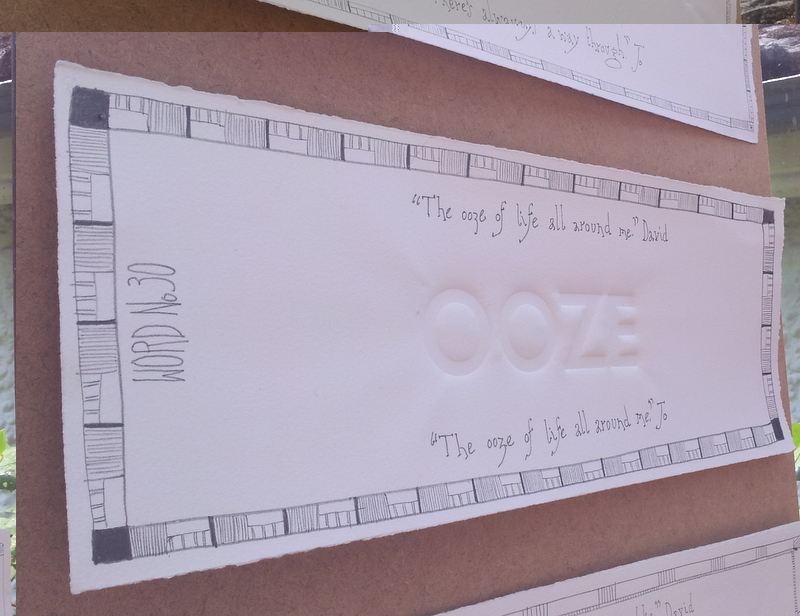 This is where I met the words, embossed with a characteristic border and a sentence or two attached; an on-going project where Jo and author David Southwell exchange a word a day online and share their response. More information can be found on Jo’s blog . OOZE. Think about it. Menacing? Friendly? What does it set off for you? In the other part of my life, online therapy is becoming increasingly important and I’ve been reflecting upon how significant the choice of word is when counselling via email or synchronous chat. I know at the recent BACP online conference, Jeannie Wrights’ workshop explored some of these areas. A written word sits and stares . It perseveres through time, always available to confirm or challenge our perceptions. It can reassure us or it can confirm our worst suspicions. We can take it to heart, squirrel it away, get it out and look at it, burn the paper it’s printed on, embroider it into the way we see the world. It perseveres for good or ill, whether a subsequent email tries to modify it or not. Psychotherapy has always been concerned with the conversation between live bodies in a shared space. At their best, words can convey the deepest emotions and bring us into relationship with others; they can also be bodged and fumbled attempts at communication. But the live presence enables an instantaneous feedback and mutual monitoring that facilitates negotiation.” That’s not the word I would choose.” “Perhaps you could suggest a better one?” In group therapy, there may be multiple choices – ‘this is how I see it’ – ‘yes, I like that phrase’ – ‘oh no, it’s too blunt’, – and so forth. Some words become shorthand for a whole series of group explorations. Side board is a memorable one. ‘This is on the sideboard’ came to mean that ‘what I am about to say doesn’t not directly follow on from anything that’s been said before, but it’s come into my head and we’ve agreed as a group that those things are important so I am going to share it with you’. We can only communicate at depth when the meanings of the words are shared and negotiated. If my version of ‘spirit’ is not the same as yours, we need to use more words to try to clarify what I am trying to share with you. Or perhaps we need a picture? This entry was posted in Uncategorized and tagged communication, drawings, Jo Roberts, meanings, online counselling, online therapy, pictures, psychotherapy, sketch, therapy, words on July 14, 2013 by Chris.